While 1979 was when 2-Tone exploded on the UK music scene, that summer also saw the resurrection of another musical tribe: The Mods. The 2-Tone and Mod movements had many similarities. While 2-Tone looked to the rude boys of Jamaica and the early ska, rocksteady and reggae for inspiration, the mods of the late 70's worshipped The Who and The Jam. The release of the movie "Quadrophenia" in the summer of 1979 set off a mod band revival which mirrored the 2-Tone bands in many ways. The bands who followed in the wake of The Jam included Secret Affair, The Chords, The Purple Hearts and The Lambrettas. 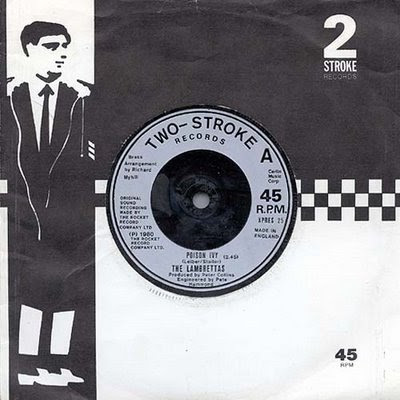 Out of all the mod revival bands, The Lambrettas were contenders for the British mod-pop-ska title, throwing down with groups like the Beat, The Selecter and Madness. The Lambrettas were formed near Brighton by Jez Bird (vocals/guitar), Doug Sanders (guitar/vocals), Mark Ellis (bass), and Paul Wincer (drums). The band first performed on June 9, 1979, playing at an all-day Mod concert. Their biggest hit was in 1980, with a ska cover version (complete with horns) of the 1950s Leiber and Stoller song, "Poison Ivy", which reached #7 in the UK Singles Chart (in a nod to the popularity of 2-Tone at the time, the band released the single for Poison Ivy in a sleeve with a look alike knockoff of Walt Jabsco dressed as a Mod). They also scored a #12 hit with the follow-up, "Da-a-a-nce". In the same year, they released the album "Beat Boys in the Jet Age", which reached #28 on the UK Albums Chart, and another charting single, "Another Day (Another Girl)". Towards the end of 1980, with Beat Boys doing well (#28 in the British album charts), the band embarked on a European tour, opening for Madness which established them further within ska circles but moved them further away from Mod circles. During 1981 they recorded their second album, "Ambience", which included two tracks featuring the saxophone playing of Wesley Magoogan of The Beat (who had replaced Saxa). Despite the album’s fine production values, and a more solid sound that included a variety of genres, it was not a success. The Lambrettas had tried to move on from their Mod image to reach a larger audience, but failed to do so as the public moved on from ska and mod power pop. Here are some videos of the band including their UK Top 10 hit "Poison Ivy" and "Da-a-a-nce"
Unfortunately founding member and guitarist Jez Bird died of cancer on August 27, 2008, at the age of 50. Here is the track list for "Beat Boys In The Jet Age"